Randy Kaplan has an unusual view of what it means for a politician to be on the ball. In 1993, Kaplan had a night to himself during a business trip to Houston, so he bought a last-minute ticket to an Astros game. When he took his seat behind home plate, the woman to his right told him that former President George H.W. Bush and former first lady Barbara Bush were home game regulars. Kaplan thought it unlikely they’d attend this game, however, as days earlier, there was a failed assassination attempt on the former president in Kuwait. Bush kindly obliged, Kaplan says, and left him starstruck. “Up until then, I had never met anyone of his stature,” he says. 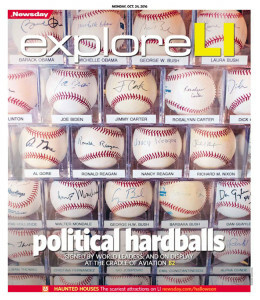 Days later, however, Kaplan regretted not having Bush sign a baseball instead. 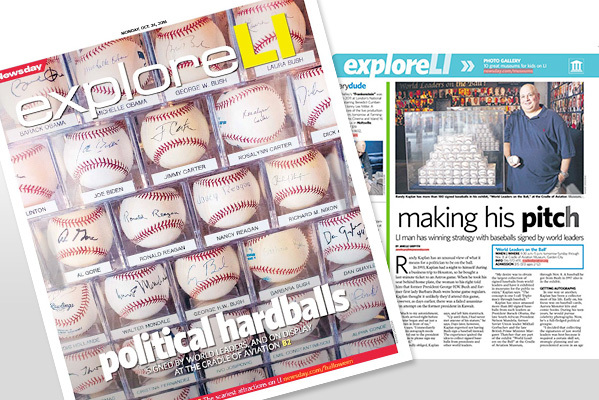 The experience ignited the idea to collect signed baseballs from presidents and world leaders. 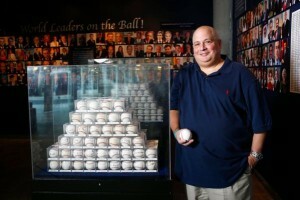 Kaplan has since amassed more than 180 signed baseballs from such leaders as President Barack Obama, the late South African President Nelson Mandela, former Soviet Union leader Mikhail Gorbachev and the late United Kingdom Prime Minister Margaret Thatcher that are part of the exhibit “World Leaders on the Ball” at the Cradle of Aviation Museum, through Nov. 8. 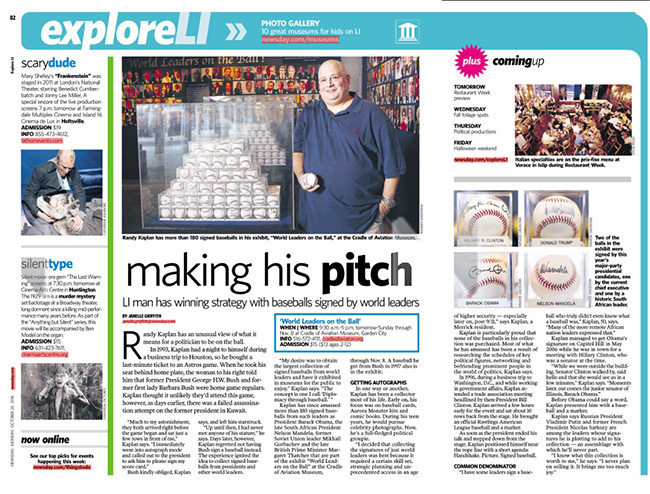 A baseball he got from Bush in 1997 also is in the exhibit. 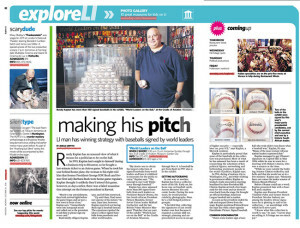 In one way or another, Kaplan has been a collector most of his life. Early on, his focus was on baseball cards, Topps Wacky Packages (peel-and-punch-out stickers), Aurora Monster kits and comic books. During his teen years, he would pursue celebrity photographs. Now, he’s a full-fledged political groupie. 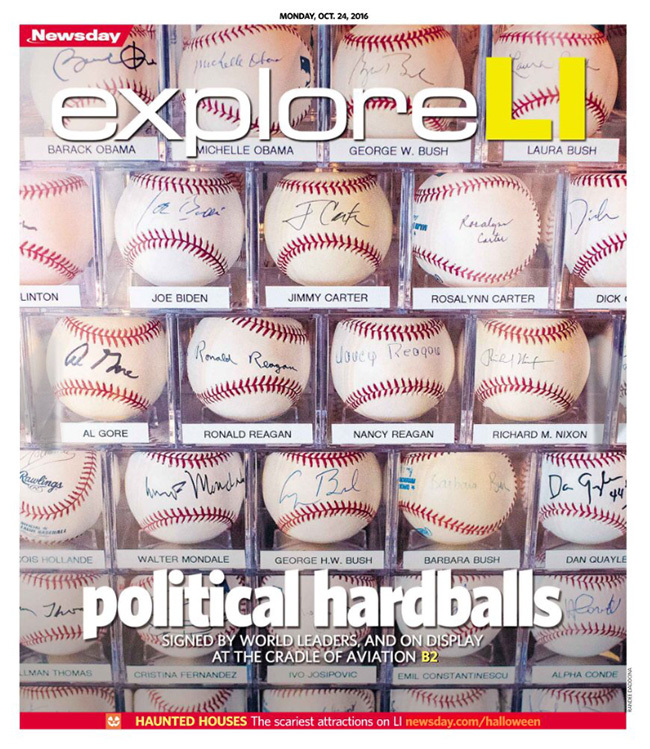 “I decided that collecting the signatures of just world leaders was best because it required a certain skill set, strategic planning and unprecedented access in an age of higher security — especially later on, post 9/11,” says Kaplan, a Merrick resident. Kaplan is particularly proud that none of the baseballs in his collection was purchased. Most of what he has amassed has been a result of his covering all the bases: researching the schedules of key political figures, networking and befriending prominent people in the world of politics, Kaplan says. In 1996, during a business trip to Washington, D.C., and while working in government affairs, Kaplan attended a trade association meeting headlined by then-President Bill Clinton. Kaplan arrived a few hours early for the event and sat about 10 rows back from the stage. He brought an official Rawlings American League baseball and a marker. As soon as the president ended his talk and stepped down from the stage, Kaplan positioned himself near the rope line with a short agenda: Handshake. Picture. Signed baseball. Kaplan surprised even himself as he scored all three. Kaplan managed to get Obama’s signature on Capitol Hill in May 2006 while in town for a meeting with Hillary Clinton, who was a senator at the time. Before Obama could say a word, Kaplan presented him with a baseball and a marker. Kaplan says Russian President Vladimir Putin and former French President Nicolas Sarkozy are among the leaders whose signatures he is plotting to add to his collection — an assemblage with which he’ll never part.